We can’t call him by any other name. “Mister Digital” suits him down to the ground. 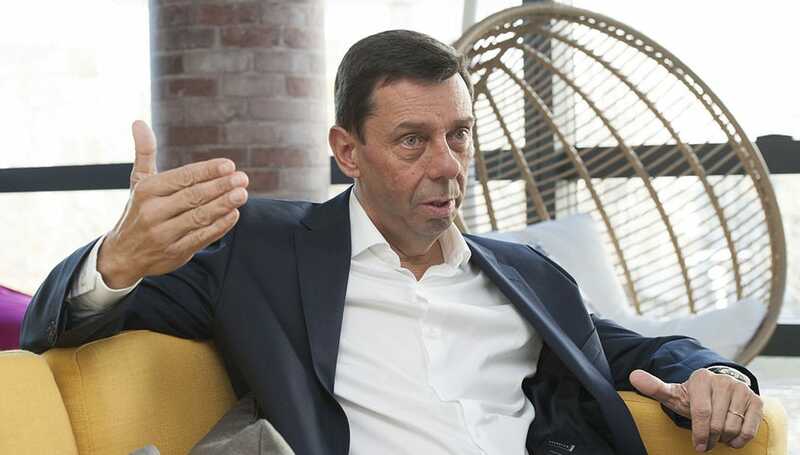 He is the executive chosen by Arval to lead the company’s overall transition to a new ecosystem where the mobility services industry will be digital…. or not at all. Alain Van Groenendael (Belgium, 1961), has no lack of experience. He has just left the position of worldwide head of the consumer finance division of BNP Paribas, Arval’s parent company. His in-depth expertise on the habits, tastes and preferences of the public will greatly contribute to a company that is very attentive to the suggestive lines of business that flow with the current of new mobility. The next three years will be crucial. This is what Alain Van Groenendael thinks. QUESTION— Mr. Groenendael, what is your vision of the company? What are your goals for Arval’s short and medium term future? ANSWER— The Group’s Board of Directors has defined the strategic objectives around three main timelines. The first of these will be developed this year in 2019. The second will be in place in 2021 and the third will be consolidated afterwards and will consist of implementing the investment processes that we will need to maintain our leadership position in the sector. The company has been undergoing transformation for some years now and we have identified three different stages or levels in this area of transformation. First of all, I would refer to people. We mustn’t forget that we are in a service company which means that our most important asset is precisely people. And in this regard we have designed new training programs, leadership development programs, programs such as the new Employee Value Proposition and we’re promoting Arval, a place for People in Action to enhance employee profiles towards greater sensitivity to the digital and data universe. Bear in mind that digitisation is key in the transformation process. It is very important, both for our customers and for our employees. We will invest a lot of resources in this area to simplify and improve our customers’ user experience. It is clear that today they expect a very fluid, digital service and experience, free from interference. One of the key points in this regard is data. Arval has an enormous amount of data on vehicles, drivers, use, etc. And what we must do is use this entire data source to improve the service we provide to our customers. The future of the company, therefore, is based on three fundamental timeframe pillars that will be based on the concept of transformation at three levels: people, digitisation and data. QUESTION— How digital is Arval today? Where does the company stand? ANSWER— I can tell you that we have just completely digitalised our processes in the Netherlands division. If a private customer like you or I goes onto the Arval website today to rent a car in Holland, you just have to access the website, check the selection of available cars and choose the one that best suits your personal preferences according to your type of driving, the type you like or the monthly budget you have. You can configure the car completely on-line. And once you have all you need, just add it to your shopping cart, enter your bank details and place your order. The process is completely digital. From the initial choice of car to the approval of the rental process by Arval. Everything. In ten minutes. One hundred percent digital. No more people are involved and it’s paper-free because even the signature is digital. I think this is a unique example in our industry and it is one of the examples we use to show our commitment to digitisation. QUESTION— This opens up a whole universe of new and potential customers, doesn’t it? ANSWER— Today’s consumers use Facebook, Amazon, Apple… they make immediate decisions in a digital environment, and we have to adapt to those needs. QUESTION— Arval concluded 2017 with significant growth in both fleet and revenue. How was the financial development of the company in 2018, during the last fiscal year? ANSWER- Our growth was just over 8% at the end of last year, resulting in a total fleet volume of 1.2 million vehicles. We are very happy with this result and with the company’s revenue volume because it came from different types of customers and divisions, it was diversified: medium and small size companies, large corporations and private customers. It also came from Latin America, Europe, different regions. We are very pleased with this business diversification. QUESTION- What can you tell us about Latin America? How is your development progressing in that area? ANSWER— Very well. Our position in Brazil is good. We are growing steadily and are starting to have very good potential and size thanks to a collaboration agreement with a very strong local financial institution. We are still looking for maximum resource effectiveness there, but once we achieve it the potential will be enormous. We are also present in Chile and Peru where we are in the middle of an acquisition process to become the market leaders. QUESTION— What is your opinion on the concept of mobility in Europe? What do you expect for the next two or three years, i.e. tomorrow? ANSWER— More like today (laughs). I think there are a lot of people talking about mobility right now. At Arval we don’t talk about mobility, we do mobility. 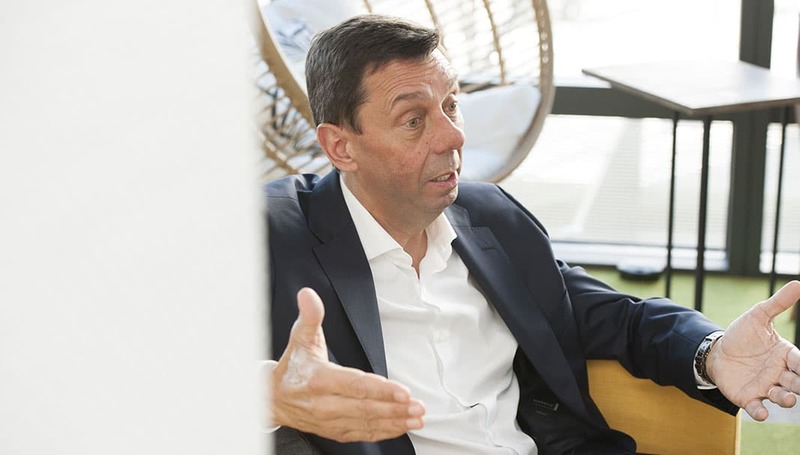 For example, look at what we are doing here in this building (this interview takes place at the Arval headquarters, in a conglomerate of offices on the outskirts of Paris). It is the perfect example of everything mobility stands for. We have a carsharing service for our employees. They can use a car for professional use, but they can also use it for private use. Last year these offices made 1,300 uses of this concept of carsharing; 800 of these were for professional purposes and the rest for private use. And 60% were carried out with electric vehicles. We also have a ridesharing system that allows Arval employees to share a vehicle with other Arval workers or other non Arval workers. We have a collaboration agreement with a start-up called Klaxit that identifies all the companies in the surrounding area with a high number of employees and manages and organises employee ridesharing from their homes to work and vice versa. This happens every day, and last year we completed more than 7,000 trips with this system which resulted in the emission of seven tons less carbon dioxide into the atmosphere. Currently we have carsharing, ridesharing and bicycle sharing for our employees. We also have private custom-made rental for our employees with quite advantageous conditions. QUESTION— When will these solutions reach your corporate and private customers? ANSWER— As you can see, mobility is not the future for Arval, it’s here today. These solutions we are currently implementing with our employees will soon reach our corporate customers who are looking for exactly the same thing. We sell private rental to any customer. To BNP Paribas employees, to our employees who are also corporate customers and if any company provides any service to Arval, their employees can also access private rental. We call it B2B2E (Business to Business to Employee). And we also offer private rental to our partners, such as CaixaBank in Spain, which is working extremely well. Alain Van Groenendael looks up meaningfully. We are talking about private rental and he doesn’t hide his enthusiasm when we ask him about his agreement in Spain with CaixaBank. 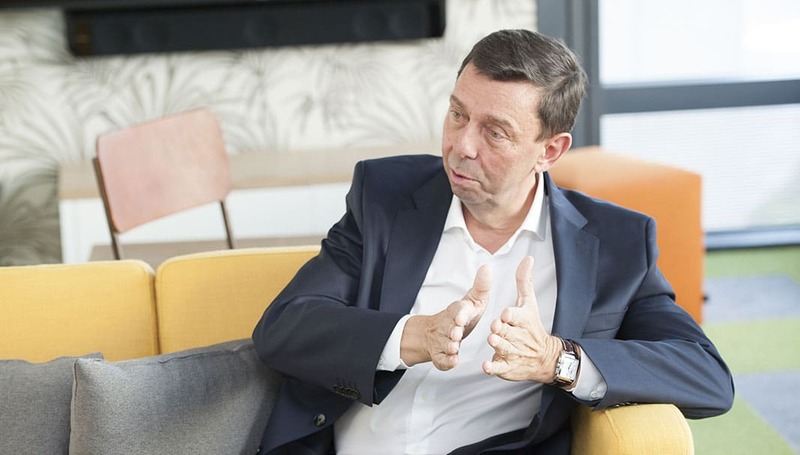 This executive comes from BNPP’s consumer finance area and goes straight to the point: “We are enjoying great success with this partnership. We signed the agreement in 2010 and it’s working very well,” he says. 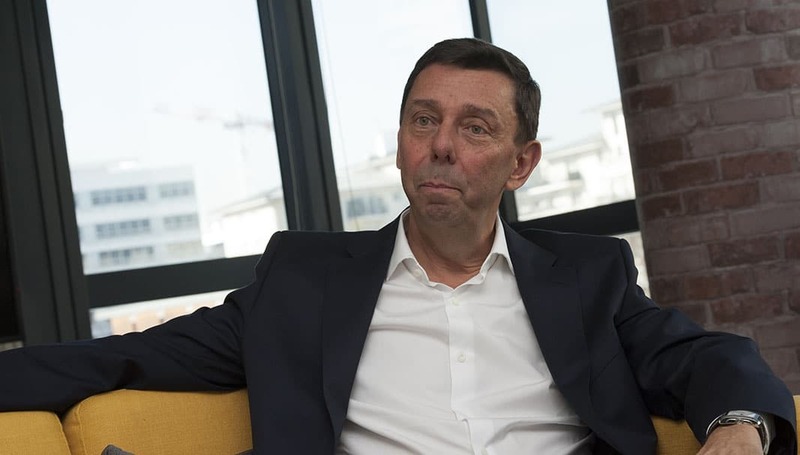 “In fact,” he stresses, “for us, for Arval, it is one of the great and best examples of external collaboration in the field of private rental, in addition to France, where we have a similar agreement with the Mamut insurance company with whom we have an agreement to supply private rentals to their customers. QUESTION— Could you explain how your ‘Arval For Me’ initiative is working? ANSWER— It is a completely innovative system that puts all the company’s knowledge, all its know-how, within everybody’s reach. As you know, at Arval we have a vast knowledge of everything related to vehicle service. Private customers like you and I sometimes don’t know what to choose when they need a service for their vehicle. Sometimes we are not sure of the prices we are offered, and we don’t want to pay too much or it isn’t clear to us which tyres are the best. ‘Arval for Me’ is designed for this purpose – to help private customers ensure the quality of the establishment they choose and the price they pay. What Arval guarantees the private customer is that they will receive a service with Arval quality. We first launched it in Italy and then in Spain. At the moment we are very happy with the results. It’s clear that the business needs some time to expand, but it’s there and is working very well. QUESTION— What do you think of electric vehicles? Does the automobile industry need to build a future where these vehicles become market leaders? Do you think there will be a big boom in these cars? ANSWER— The trend is out there, and it saw some reluctance in the beginning, but there it is. In the case of our customers, and by way of example, when we talk to our corporate customers we try to identify their real needs. The type of car they need for their executives, for commercial strength, and based on the type of car, kilometres and use, we make recommendations and give options. Electric cars cover a certain driving need and Arval firmly believes in them. The problem we have is that today there are not many electric cars available. We would love to rent many more electric cars, but we need an availability that isn’t there. I know that car manufacturers are investing a lot of money in these vehicles, but the reality is that their number is still very limited. ANSWER— Perhaps. It depends on the country. There is aid in France. But in our case I can tell you that we have developed some rental proposals for private customers and they tell us that they love electric vehicles, but when they go on holiday 800 kilometres from home or go skiing 600 kilometres away, the electric vehicle can be a problem. What we do in this regard is offer our electric vehicle customers a non-electric car for six weeks a year, free of charge. We firmly believe in the electric car and have agreements with energy suppliers. I can tell you we’ll be making an announcement on this very soon. QUESTION— What do you think about the diesel problem? Are you reducing your portfolio with this fuel? ANSWER— A large part of our corporate customer base consists of technical positions and commercial strength that drives a lot and travels many miles a year. Diesel was and is the best solution for this type of customer profile that covers 40 to 50,000 kilometres per year. The new diesel engines and the new NOX and CO2 measures indicate that the new diesel engines are below the minimum requirements of the European standard for 2021. The new diesels are much cleaner and will continue to maintain a lower proportion than the current level. In fact, at Arval we will move from 90% of diesel vehicles from a couple of years ago to a 45% reduction in 2021. We will halve our fleet of diesel vehicles and participate in the energy transition, but we still believe that new diesel engines are clean and should be considered by our customers. QUESTION— Do you think society is aware of what you’re saying about diesel engines? Generally speaking, it doesn’t seem to, at least not in Spain. ANSWER— Communication on this issue has been a little, we might say, one dimensional. Since 1995 everyone has said that diesel engines consume between 20% and 25% less than petrol engines. And the Kyoto Protocol signed in Japan to combat climate change pointed out that diesel cars emitted less carbon dioxide than gasoline. Global warming is mainly caused by carbon dioxide, as you know. That’s why all governments and countries provided incentives for diesel engines. What has happened is that since 2017 and after the Volkswagen scandal, diesel, which was the superstar, became the bad guy in the movie. But to return to the question, many customers are very confused about it. QUESTION— Do you think the global leasing and rental sector is now fully consolidated? Will there be more mergers and acquisitions? ANSWER— Well, anything can happen. In our case, being a large company is an advantage because we have large economies of scale. And belonging one hundred percent to a big company like BNP has many benefits. If you think in terms of partnerships, ours with Element in the United States is significant because we’re talking about two million vehicles in 50 countries. That makes us the world’s largest leasing alliance. QUESTION— In your opinion, what measures should a company in the sector take to maintain a competitive position for the future? What are the key factors? ANSWER— The important thing is to offer a benchmark quality of service and customer satisfaction. The car is Arval’s core business, but not the only one. Cars are important, but we have to move towards mobility solutions in which the car will play an important role, but not on its own. We have to provide our corporate clients with short, medium and long term solutions, carsharing, ridesharing, etc. We’re working in that direction and we’re doing it all over the world.